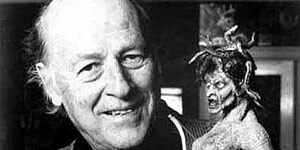 Entertaining tribute to the work of Ray Harryhausen, enlivened by a superb, lengthy interview with the great man himself, some terrific archive footage and extensive clips from his remarkable body of work. Directed by Gilles Penso, Ray Harryhausen: Special Effects Titan is a documentary that takes a loving look at the work of Ray Harryhausen, referred to within the film as ‘the grandfather of stop-motion animation’. Alongside extensive clips from his movies (not just his creature features but also his early work on, for example, the George Pal Puppetoons), the film also features some terrific archive footage, including his own home-made short films and his first experiments with bringing creatures (primarily dinosaurs) to life with the stop-motion technique. The film's central focus is a lengthy interview with the great man himself (92 and still going strong), spanning his entire career, from the 1930s until Clash of the Titans in 1981 (though rights issues seem to have come into play regarding clips for that film). In addition, there are talking head contributions from collaborators (Caroline Munro, Martine Beswick) and a series of high profile fans (directors Steven Spielberg, James Cameron, Peter Jackson, Tim Burton, Joe Dante, stop-motion directors Nick Park and Henry Selick, special effects maestros Dennis Muren and Phil Tippett), all eagerly discussing Harryhausen's heavy influence on their own films and careers. Harryhausen proves a lively and entertaining interviewee and he reveals some amusing anecdotes, such as the fact that the San Francisco authorities weren't happy with the plan to have an octopus destroy the Golden Gate Bridge in 1955's It Came From Beneath The Sea (as someone else points out, the creature actually only had six legs, leading Harryhausen to nickname it ‘the sixtopus’). He also talks about his disappointment surrounding the delayed release of cowboys vs dinosaurs movie The Valley of Gwangi, which contains some of his best effects (and is great fun) but never achieved the acclaim or the box office success of his other films. The archive footage is wonderful, particularly Harryhausen's early efforts, augmented by personal details such as the fact that his dad helped him make the miniature dinosaurs and continued to assist in model-making throughout Ray's career. It's also fascinating to hear each of the big-name directors discuss specific moments from their films that were directly influenced by Harryhausen; Spielberg, in particular, recounts showing Harryhausen the CGI work on Jurassic Park and noting that the creatures still move in a recognisably Harryhausen-esque way. Ray Harryhausen: Special Effects Titan is a thoroughly entertaining documentary that's a must-see for fans of creature features in general and Harryhausen in particular. Recommended.